What Counts as a PR? PRs are what we competitive runners live for! Oh my gosh! I just ran a 5k PR on the treadmill! YES! I ran a 10k, 15k, 10 mile and half marathon PR in my marathon! 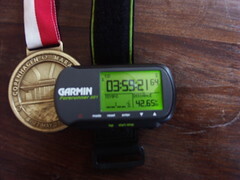 I just ran a minute 5k PR, but everyone (and my Garmin) think the course was 3 miles instead of a 5k. My GPS said the course was 13.4, but at 13.1 I had a 30 second PR, but was over a minute off my PR when I finished. It’s happened at least once to everyone who trains with a GPS watch. You spend months refining your pace to the exact second per mile. You run a virtual race almost every week against your GPS to drill that exact pace into your body. You line up for the race primed to run an exact PR, and then your GPS signals that you’ve completed the race in your exact goal time. YES! But, wait. How Far Was That Marathon? Oh that Grandma and her nagging about drooping uteri and silly questions about race length. I always laughed her off, but what if she was actually on to something. Recently there was a big race in town and many runners wondered if the course was short. It got me wondering, when you finally hit the finish line how do you know how far you really went? Unless the race was USATF certified it’s difficult to know whether the race course was the advertised distance.